The seminar will discuss the differences between the effects different of tax-spending instruments used for debt consolidation in the presence of cross-country labour mobility using a general equilibrium framework. Guilherme will present the main takeaways from his most recent publication, “Should I stay or should I go? 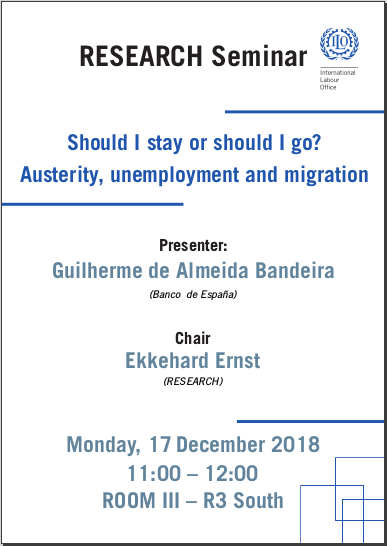 Austerity, unemployment and migration”, highlighting how high unemployment and fiscal austerity during the Great Recession have led to significant migration outflows in several European countries. The seminar will also discuss how these migration flows in turn have impacted unemployment, both in the short-run and in the medium-run. Guilherme de Almeida Bandeira is a Research Economista the Banco de Espa?a in Madrid. In the past, he has worked at the Reserve Bank of Australia, the Banco de la República (Colombia) and the Centre for Micro Finance – IFMR (India). His research focuses on both empirical and theoretical aspects of open economy macro and macroeconomic policy, including fiscal policy, employment flows and wages.